Cooking beans is simple, it's healthier than precooked canned beans, and homemade beans taste better than anything from a can. "Do I need to soak these beans?" "For how long do they soak?" "How long should these beans cook, and at what temperature?" "What proportion of water to grains do you need to use?" If you struggle to remember how to cook beans and grains, this guide is perfect for you. Cooking beans and grains is now as easy as remembering to pull out this handy little guide. I recommend printing this out and storing it in your cupboard with your other cookbooks, or even near your dried beans and grains. I’ve had a makeshift one that I put together on hand for years and I find myself referring to it often. Now it’s all in one place! A lot of people assume that a vegan diet is expensive, but it really isn't. The healthiest vegan diet includes plenty of dark, leafy greens, vegetables, and fruits, and these are all cheaper than buying slabs of meat and cheese. Bulk beans and whole grains come in the cheapest part of the store. You can economize even more by buying them dried and soaking and cooking yourself, rather than just buying canned beans. Starting a vegan diet does not have to be more expensive than a standard diet, especially if you cook your own food. Also, if we talk about the long-term benefits of a vegan diet, we know health care bills are much less expensive on a vegan diet than on one that harms your health. When putting together a vegan pantry, don't feel overwhelmed or tempted to buy everything at once. There’s no need to go out and buy every one of these beans and whole grains. Start with a few easy recipes and mark off the ingredients you will need to create those recipes. As the weeks pass, you can keep picking up a few new items at the grocery store. If you are making a big change in your diet, this process can be expensive, so take as much time as you need with the switch over in your pantry. To save time in the future, I recommend cooking extra beans and saving them in freezer tight bags or containers and marking the date they were cooked. You have up to six months to eat cooked beans. Grains will store in the refrigerator for several days, and can often be added to other meals, like in cereals, muffins, breads, soups, stews, and casseroles. I always find it easier to make more and store it for later. 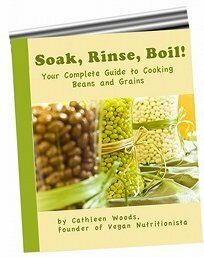 Learn how to cook beans and grains the easy, quick, fun, and vegan way! Immediately after your purchase, you can download your guide on how to cook beans and grains, vegan style. Your copy of Soak, Rinse, Boil! is in the Adobe PDF file format, which you can download for free. After purchase, you will receive instructions on how to download Adobe and your grocery list. The eBook comes with a 100% Money-Back Guarantee: If for any reason you're not 100% satisfied with your bean and grain cooking guide, just email me within 8 weeks of your date of purchase - and I'll issue your 100% refund immediately, no questions asked. What have you got to lose? Free Email Support: With your purchase of Soak, Rinse, Boil!, you'll receive personal email support. You are welcome to ask a question at any time. Secure Payment: Your purchase is 100% safe and secure - and 100% risk-free. Whether you pay with a credit card or PayPal, every transaction is secure. Check out my full list of ebooks, many of which will also help you to learn the concept of how to cook beans.